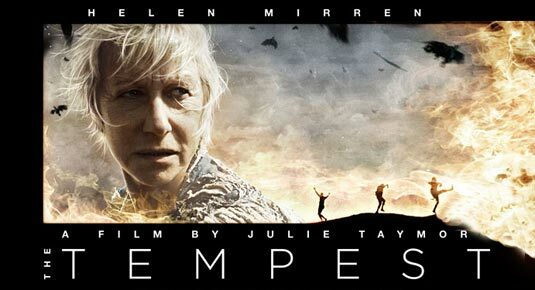 My two favorite parts of the trailer are absolutely Mirren as Prospera and Djimon Hounsou as Caliban, Prospera's slave. To me, these were always the two most compelling characters in the story and it looks like that will hold up on the silver screen as well. I'll reserve judgment for now on Russell Brand as Trinculo — he isn't really my cup of tea, but we'll see how it all pans out. As for the special effects, in the context of the trailer they appear a little outdated, but I felt that same way after the Across the Universe trailer only to have my mind changed upon seeing the movie. Taymor is known for being a "visionary" and the aesthetic qualities of her productions are never done haphazardly. Finally, the story does have a lot of subplots that could potentially overwhelm audiences, and I'm curious to see how Taymor juggles them all. 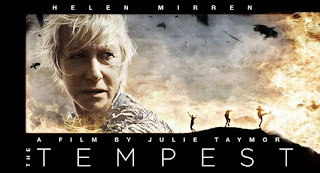 Perhaps it is my predisposed love for the story, my adoration of Mirren or my faith in Taymor's vision, but for now I am willing to overlook the negatives in this trailer and continue to look forward to The Tempest's December 10th release. What about you, dear readers? Are you a Tempest fan? Is your anticipation building or dying after seeing the trailer? And are you as excited as I am to hear Hounsou cry out "'Ban, 'Ban, Ca-Caliban / Has a new master. Get a new man"?